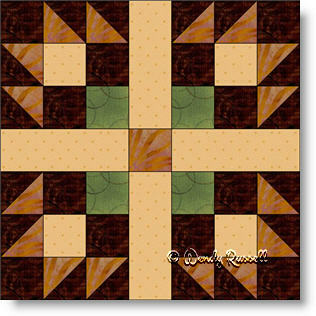 The Best Friends quilt block is a seven patch block with lots of pieces. But, the good news is that none of the patches are difficult to make. In fact, only squares, rectangles and half square triangles -- the most commonly used patches -- are required in this block. For simpler construction (at least in my opinion), I choose to construct it as an uneven nine patch. The sample quilts illustrated are both constructed with an on point setting, but with just a few changes, they look very different. Your imagination is your only limitation.